Commercial drones are taking the world by storm– industry niches are uncovered and served at an incredible pace. The beauty of today’s technology, however, has more to it than just collecting vast amounts of data – in fact, it is the beauty of drones moving through the air itself. This new medium seems to annul gravity, allowing endless new possibilities to writers, directors and actors in stage entertainment. And entertainment is a big deal – the US market value for entertainment alone is expected to exceed $655B USD in 2017. The slide “Drone Show Operators – The Beauty of Technology” helps to gain an understanding of the current players in the commercial drone show market and their location. Now, what kind of drone shows are there and what applications can be found today? Drone shows must be separated into two categories: indoor and outdoor operation. This distinction is not, as you may expect, caused by regulation but in the way they navigate. As a stable and precise GNSS connection is not available indoors, the operators must use other navigation systems, e.g. motion control systems or indoor positioning systems. This leads to a much higher effort in preparing the show as well as for deinstallation and reinstallation. Especially if you change the event location every week, as for example was the case at the latest Muse tour. For most in- and outdoor operations, human pilots are still required (CTRLme, Aerotain). This becomes quite challenging as soon as the number of drones increases to a very large amount. Hence, fully automated and individually pre-programmed drones are more reliable and secure when it comes to large displays. Great examples are drone shows like Intel’s Drone 500, Skymagics show at Mt. Fuji, Collmot Robotics multi drone light show or Verity studios show Paramour. The safety standards for both, in- and outdoor operations are extremely high to guarantee the safety of the audience. Safety systems can be installed on the drone itself (e.g. a helium balloon cover used by Aerotain or Oli Metcalfe or redundant flight control systems) or externally, as geofences or grids to ensure a safe performance. But why have drone shows so far not reached a broader audience? The regulation for swarm- and night operation, as well as the flight over crowds, is illegal in most countries. Additionally, high costs for programming and re-programming of the drones decelerates wider adoption. This explains why drone shows are not (yet) mainstream events and only shine at very exclusive events. Unlimited, noiseless and repeatable fireworks without polluting the environment are only some of the big advantages. One of the most exciting and largest drone shows was Lady Gaga’s Super Bowl halftime show, presenting a colorful, swirling backdrop as she stood on the roof of Houston’s NRG Stadium. Operating drone shows efficiently will require a larger scale and higher rate of repetition. Disney World is already filing patents to include drones as part of their frequent fireworks. Costs will drop as soon as swarm intelligence reaches a higher degree of maturity, saving endless hours of individual programming. Knowledge gained from this development will help the whole industry to use better indoor navigation systems and swarm intelligence at scale. Drones are fun! Thank you for the useful article. Thanks for the article and highlighting this part of the drone industry! I’m going to add Arrowonics (www.arrowonics.com) to the list who is a Canadian based company that produces drone light shows and Great Lakes Drone Company ) that Arrowonics set up as their US partners. 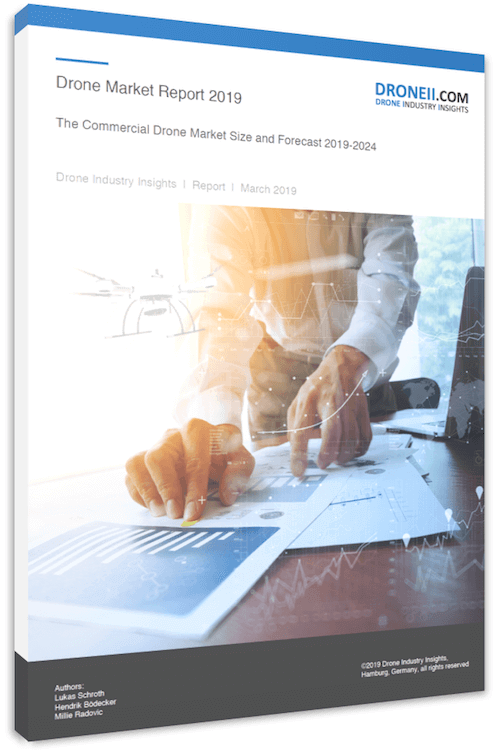 Get the “Drone Market Report 2019“ including forecast until 2024, regulation readiness index per country, trends, and perspectives on the commercial drone market.